Twins Boxing Gloves with the Velcro wrist strap are made to withstand the immense pressures that world-class Martial Arts competitors put upon their equipment. The 10 oz gloves are designed for competition bouts. The 12, 14, 16, and 18 oz gloves are ideal for training and sparring. Their heavier glove provides for a rigorous workout and the attached thumb design prevents injuries. The construction of the Boxing Gloves helps improve the proper form and power of punching; the extra hand padding is designed for hitting the heavy bag or sparring with a partner. 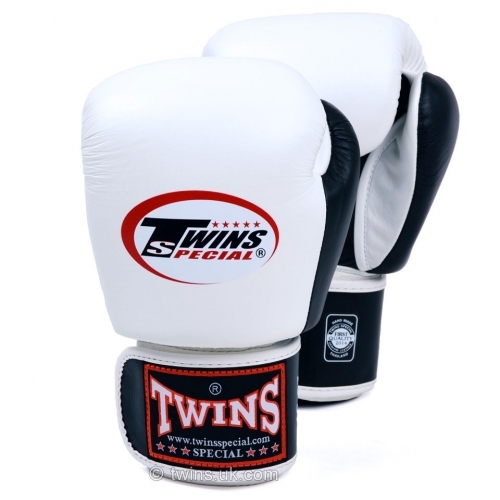 These exceptional gloves will provide you with the functionality and long-lasting durability TWINS SPECIAL is known for. The wrist strap uses a Velcro closure; this allows for a quick secure fit that supports the wrist without giving up comfort. Whether you are training in western boxing, Muay Thai, or MMA you will not find better quality leather Boxing Gloves on the market.